Yesterday I was digging through my t-shirt drawer, weeding out the ones I never wear anymore, and uncovered a sock that was tucked inside the neck of a shirt. I just about shouted for joy! It was my long lost sandhill crane sock that had disappeared sometime after a trip to Florida at Thanksgiving. I was really sad that I had lost it and finding it made me so happy that I was smiling and in a good mood for the rest of the day. It's a little hard to explain, but I have a strange emotional attachment to some of my socks and earrings. They each give me comfort in some way. 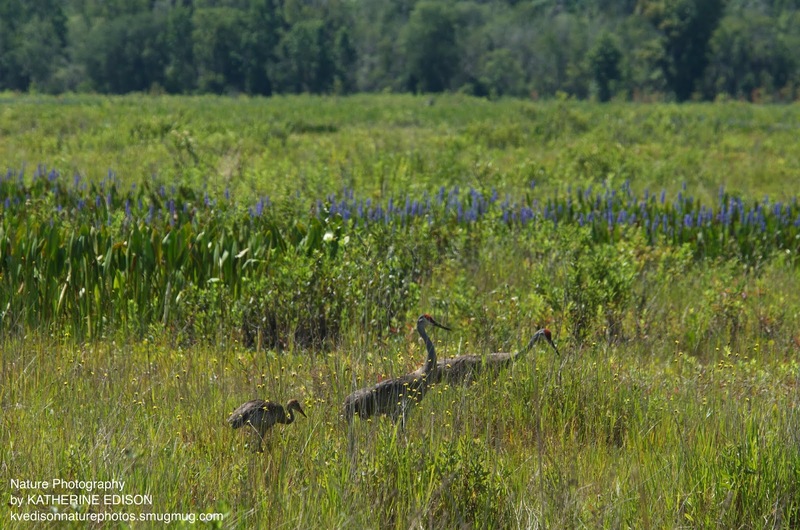 The sandhill cranes were one of the things I missed most about moving away from Florida (besides family and friends, of course!) and these silly socks were a friendly reminder of the birds I had grown to love during our time living there. Headline News: Beloved sock, found again! 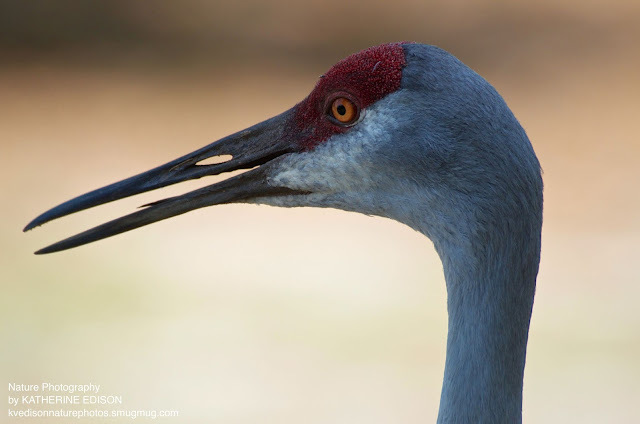 Sandhill cranes are beautiful and large birds (3-4 feet tall) with long legs, a huge wingspan, long bills and a striking red patch on the forehead. They live in families or pairs, but during migration and winter gather together in large flocks. They prefer marshes and fields where they can feed on seeds, roots, bugs and small critters. The marshes give them protection from predators. 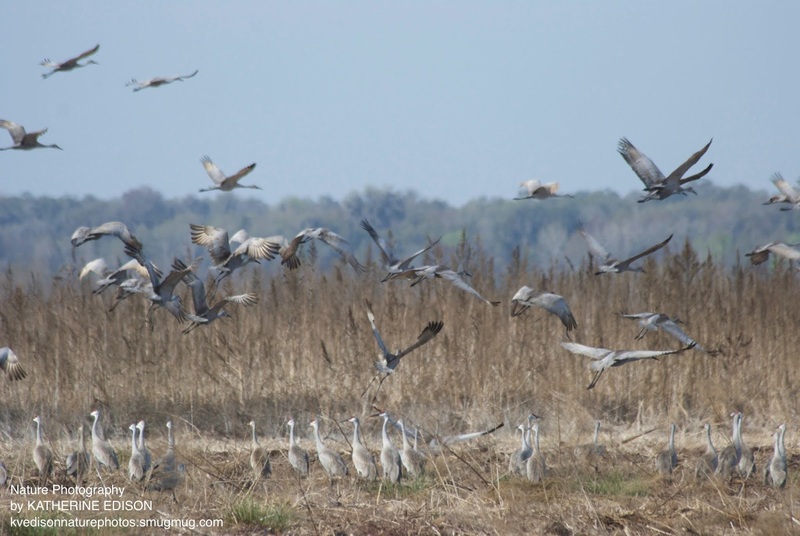 Over the years, Paynes Prairie Preserve State Park, just outside of Gainesville, with its wet prairie and wide open spaces, has been a preferred wintering ground. Their breeding ground is far to the north where they spend the summer. For the cranes that migrate to Florida, this means Ohio, Michigan, Wisconsin and up further into Canada. When the cold and snowy weather arrives in the fall, like all good snowbirds, they head down south. 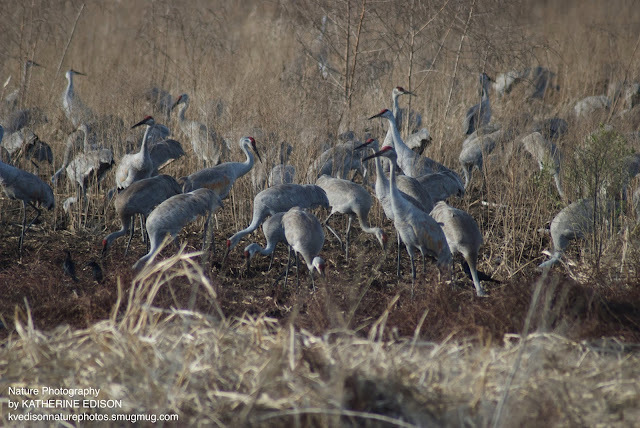 The cranes arrive in bunches, usually flying in at night. I read that they can fly 170-450 miles per day, probably depending on a good tail wind and whether they find good resting and feeding spots along the way. 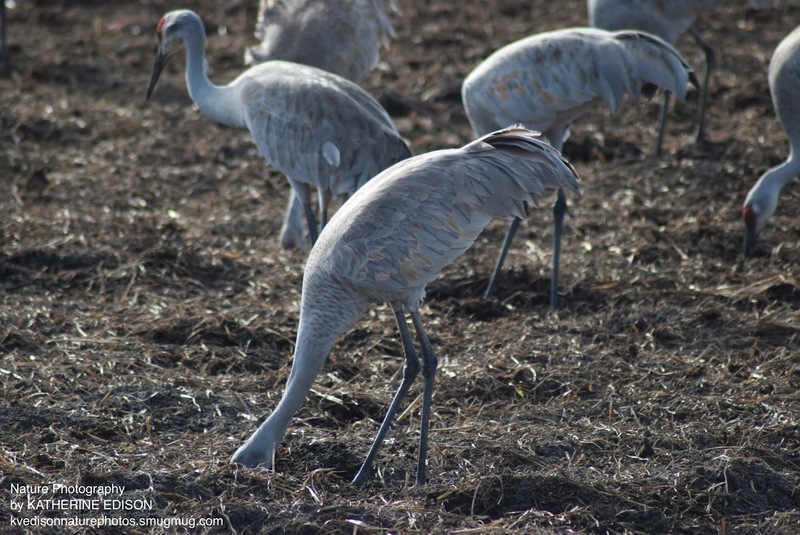 More cranes keep arriving all month and the flocks grow bigger. After a few weeks it will be common to see large V's of cranes taking off together around mid-morning from their nighttime resting spots to the marshes and farm fields where they pick through the muck and animal feed. Searching hard for food. Got to get every last bit! They stick around in sunny Florida, fattening up until February or March, then start the trip back north to breed. They usually lift off mid-morning, maybe because the thermals are better for flying. 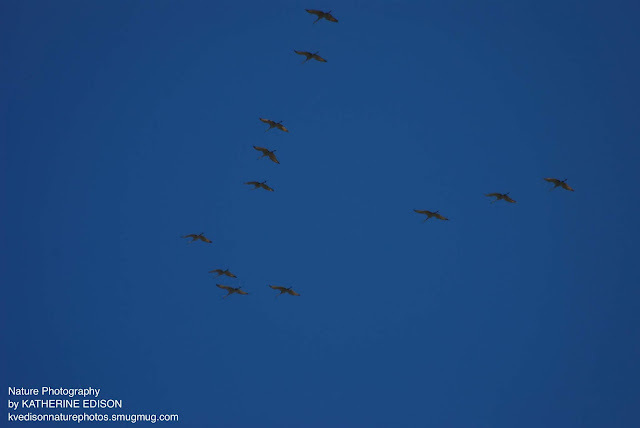 They circle overhead, waiting as the groups gather, and then they leave in waves, like squadrons of fighter planes moving out. As with arrival, leaving goes on for a few weeks. Both our homes in Gainesville were under the flyway and I'm not sure if I can count the number of times I was outside working in the yard or out running errands or walking and heard the unforgettable sound of cranes calling. 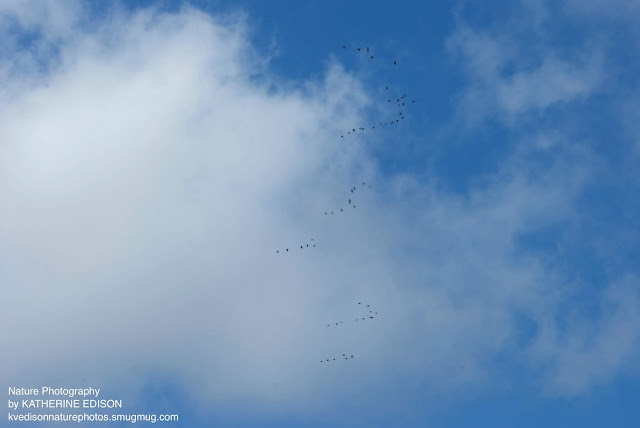 I would stop whatever I was doing and just stand watching them as they flew overhead, calling and answering in their familiar trumpeting voices. I felt a thrill but also felt sadness as I said goodbye for the season, wishing them well on their journey. Until next fall, friends. In 2008-9 an exceptionally large number of cranes wintered at Paynes Prairie. People estimated that there were 8000 cranes in Gainesville that year. It was an amazing sight. You should see the mess left when a big flock of cranes has spent the winter. The ground was all turned up and every green sprout and seed and slug had been pull out in their furious search for nutritious food. It looked like it had been rototilled. But the plants grew back again, though the cranes really had changed the landscape that year. When the huge flocks headed back north that spring, the sound as they flew and honked overhead was like a roar from a stadium. I remember being so excited that I grabbed the phone and called my mom and dad in California so they could hear it, too, forgetting that there was a time difference. I'm pretty sure I woke them up, but it was for a good reason. 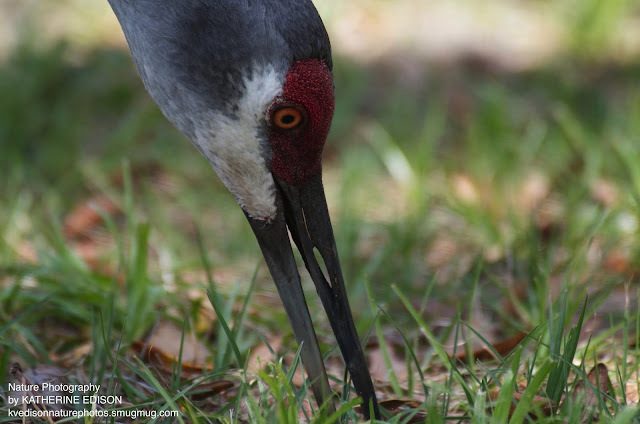 Click here for to see a short video and hear just 2 cranes calling to each other. Multiply that sound by several thousand and you can get the idea. Feeding. See how they have turned the soil? 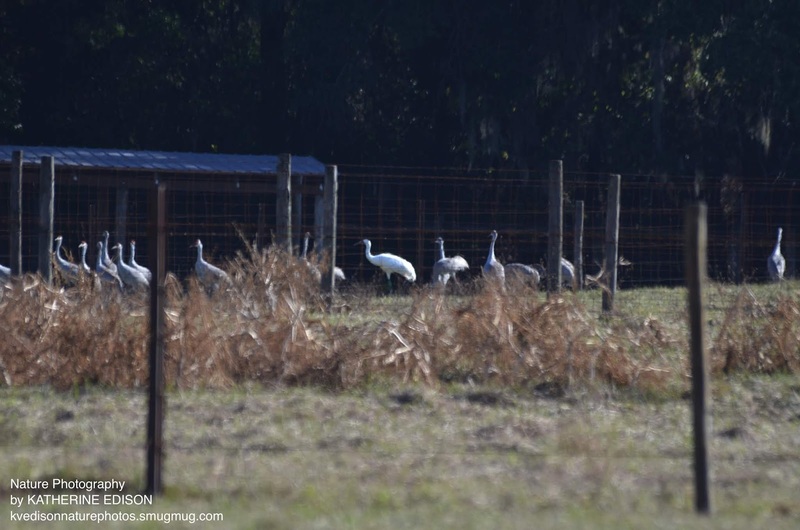 Over the last several years, fewer cranes have been wintering in Gainesville. Whether this is due to flooding from hurricanes, loss of habitat along the way, climate change, better food elsewhere, is not clear. It is also not clear if they will return to the area in large numbers again. I don't believe that the population is suffering, but they might just be relocating. This year I heard that more were reported at Okefenokee Swamp in Georgia. 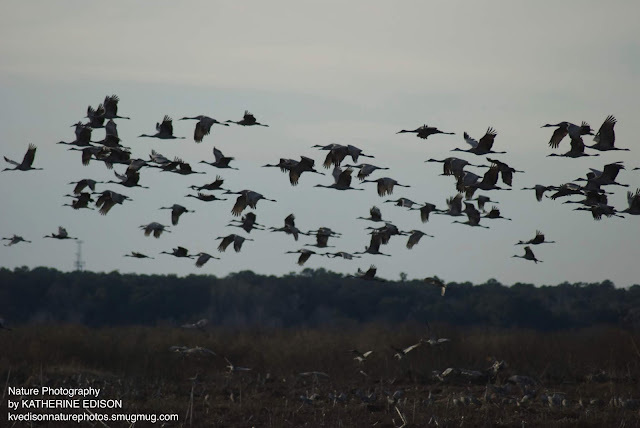 Thousands of cranes still make the trip down to points south and to Florida, and the non migratory population will stay as long as they can find good habitat. 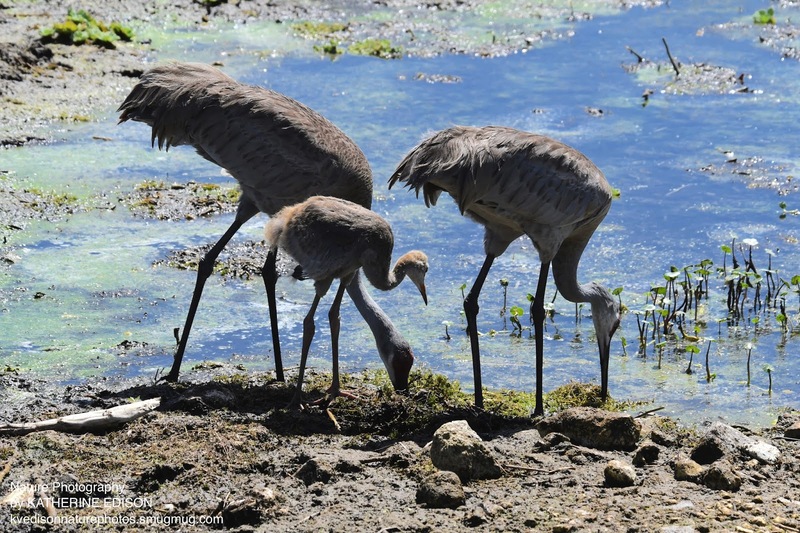 Overall, the success story of the sandhill crane is heartening. At one time there were fewer than 1000 left. But due to conservation efforts they have thrived. They still face threats from habitat loss, pollution, hunting and climate change, but their numbers are currently strong. 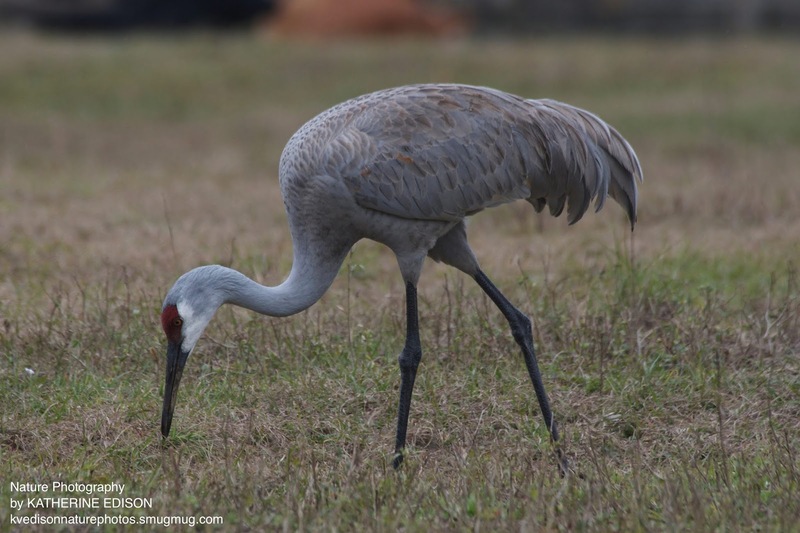 My friends in Gainesville say that the cranes are gathering and heading north again and people around Kennesaw, north of Atlanta are seeing them now, too. Unfortunately here in Athens, we are far enough away from their flyways that we don't often get to experience the huge flocks flying overhead. 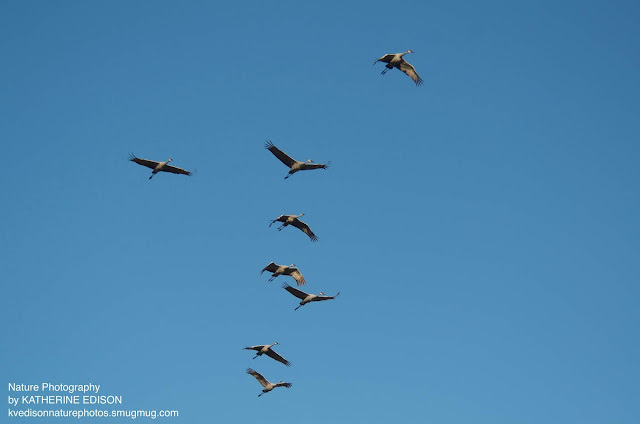 I saw one lone crane flying over Athens last fall but never heard the rattling call that thrills my heart. For that experience I still need to head closer to I-75. Even better, maybe one day I can visit the Platte River in Nebraska in the spring. I can only imagine how wonderful it would be to hear the sound of 500,000 plus cranes calling. 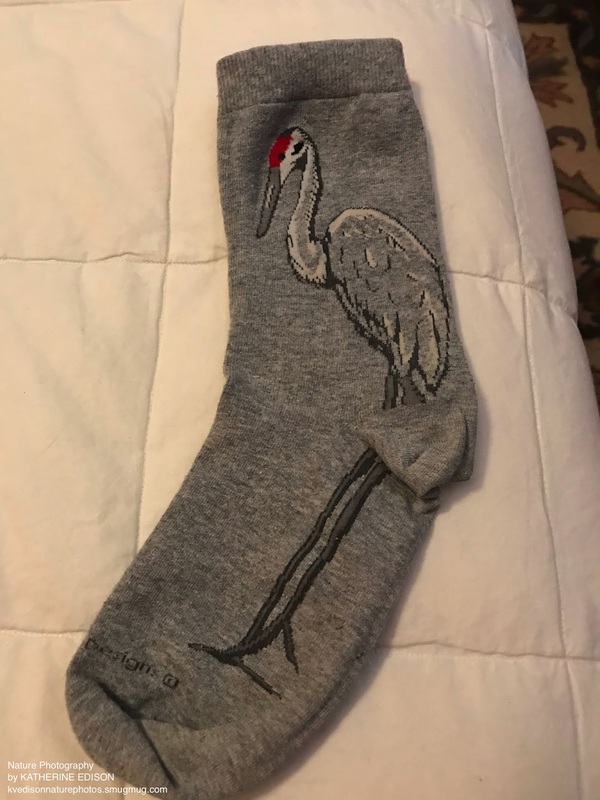 Meanwhile, my socks are mementos of the cranes I love. But I worry that they will wear out one day. Maybe I need to find something a bit more permanent to hold onto. Like a tattoo? Hmmm. I love the fall. Cooler and drier temperatures make it a lot more pleasant to walk outside, watching for migratory birds and butterflies. Wildflowers like asters and Wingstem look pretty against the ripening grass and colorful leaves. 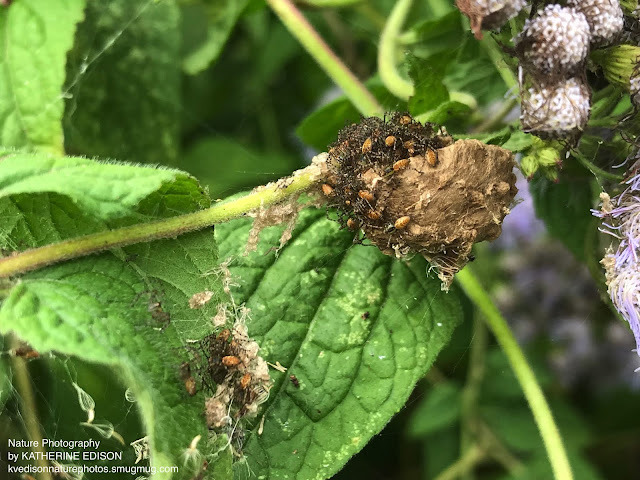 And insects and spiders that hatched in the spring and matured all summer are feeding to fatten up enough to lay eggs for next spring's brood. 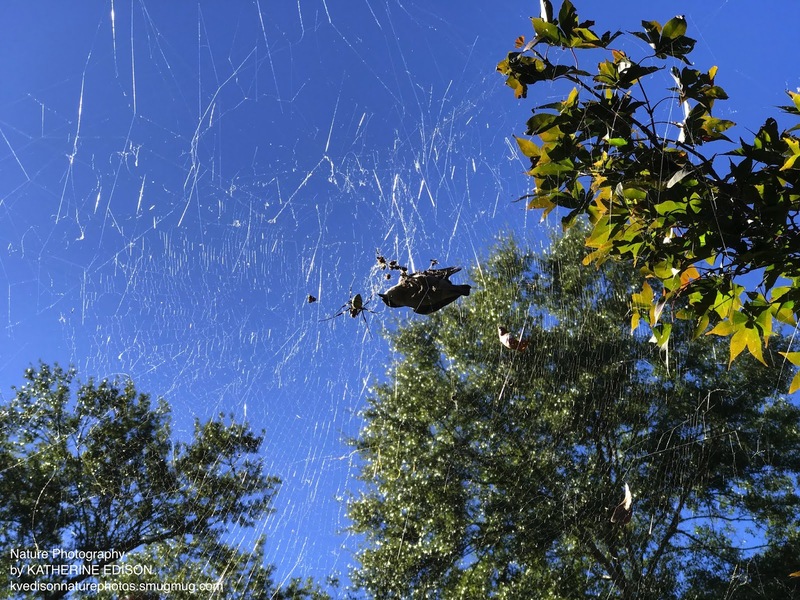 When the school nature walks start up again at the nature center each fall, I tell the children that one reason I need to be the leader is so that I can get a face-full of spiderwebs before they do! Starting in about September, any fall morning walk on a trail involves much arm waving and face wiping to remove the spider webs stretched during the night. This time of year I find spiders and their signs all over. 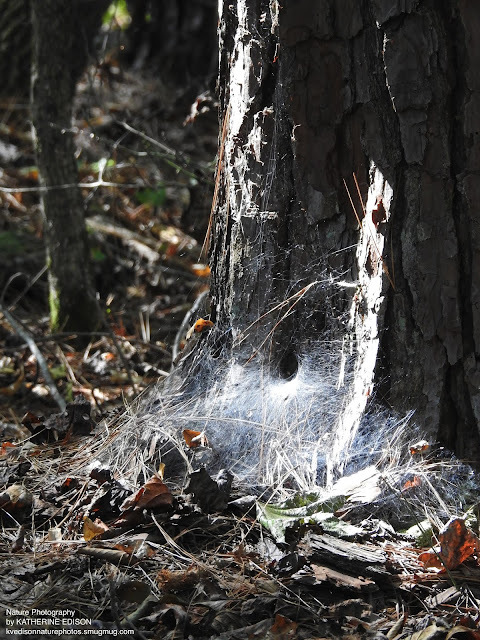 Webs stretched from trees, from buildings, covered with dew and full of drifting seeds. I've found funnel webs and chains of mummified remains of insect meals. 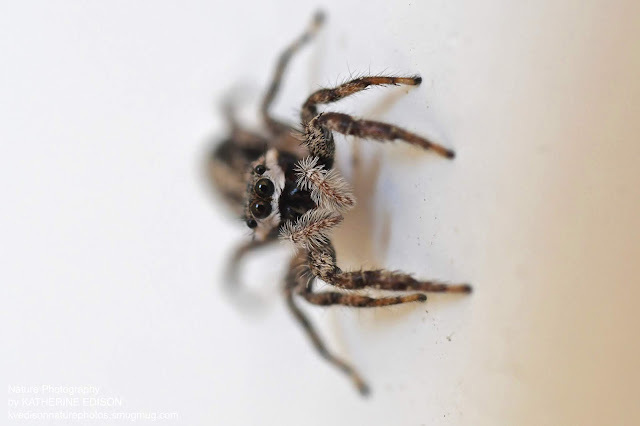 A jumping spider took up residence in our porch. 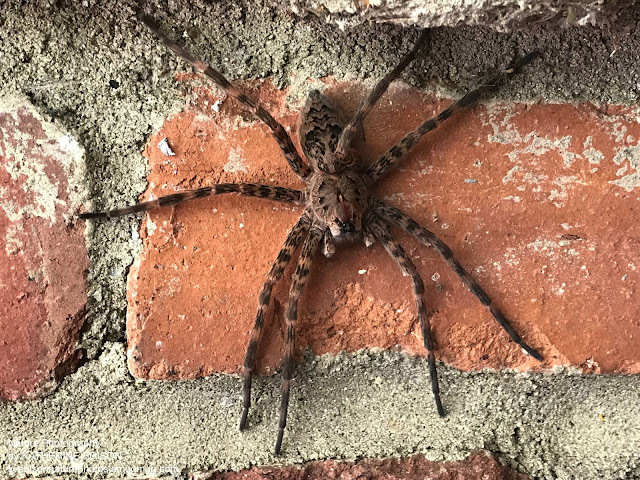 And an enormous Dark Fishing or Nurseryweb spider appeared at the entryway to the nature center, greeting all visitors for an entire afternoon. Some people are really scared of spiders. I don't blame them. They are strange looking and hairy, and they have an unfair reputation for biting. (Mostly, if you leave them alone, they leave you alone.) I was looking up something about Little Miss Muffet when I chose the title for this post, and found that some people think she was the real daughter of an entomologist, Dr. Muffet, whose spiders scared her. Personally, though, I think spiders are marvelous and beautiful. 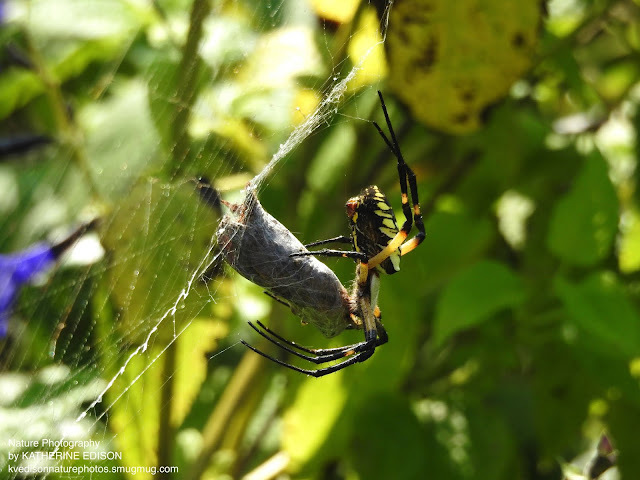 I don't think I really appreciated them until I moved to Florida and was introduced to the glorious Golden Silk Orbweaver (sometimes called "Banana") Spider that spins her strong golden webs that can stretch a couple of feet in diameter and are strong enough to catch a lizard. They would set up in the treetops, between the utility lines, and often on the side of our house, sometimes just outside a window. All summer I would watch the females as they grew huge, feeding and tending their webs, eventually affixing a big fuzzy egg sac nearby. I watched the strangely small male spiders stay out of the way, and the shiny web parasite spiders that grabbed a sneaky meal caught by the big female, and sometimes even consumed web. You can read more about them in this post from October 2012. We've had some good spider activity at our house this year. 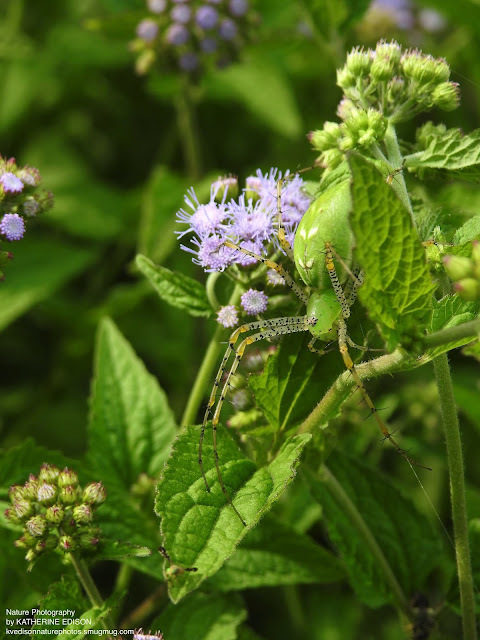 Early this summer, I found the first Green Lynx spider that I had seen at our house. She was perched on top of a flowering milkweed plant. I was away a lot during the summer and didn't pay much attention to her again until fall when I spied her with a Monarch Butterfly that she had snagged for a meal. Lynx spiders don't catch food with webs, but instead position themselves atop flowers and wait for unsuspecting pollinators to get just a little too close, and...pow! 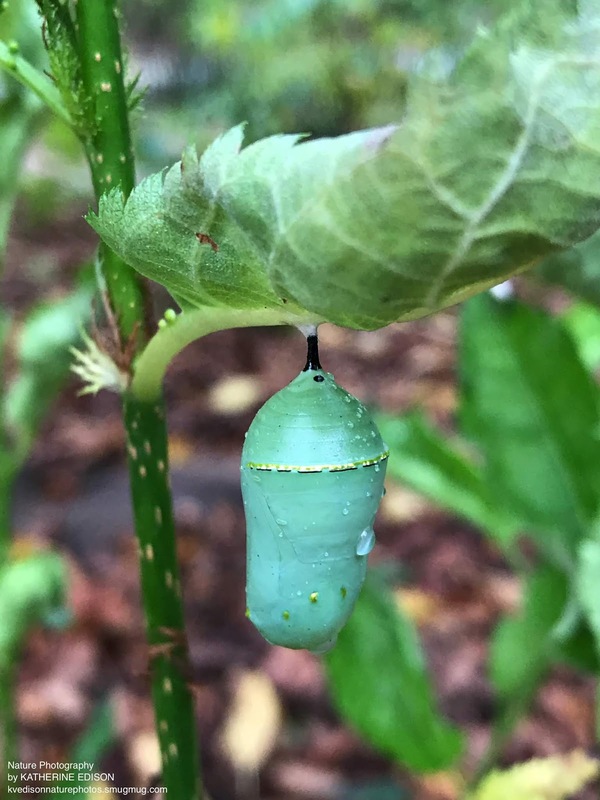 At first I was shocked and a little sad that the Monarch had become prey in our garden, but I watched her lay eggs and knew she did get a chance to pass on her DNA to the next generation. 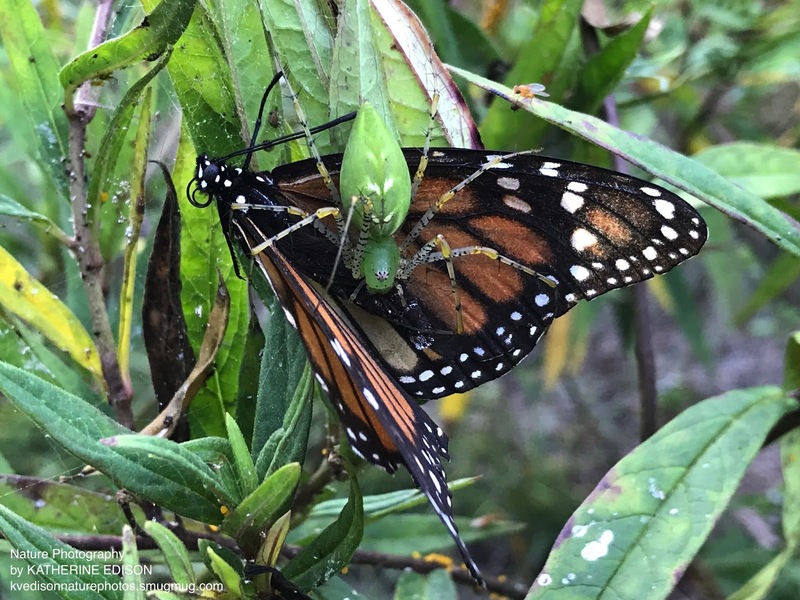 A few days later, I found the spider with another large meal, a Monarch caterpillar. But once again, I wasn't too sad because the milkweed bush was loaded with caterpillars, and if they all survived they would have run out of food. 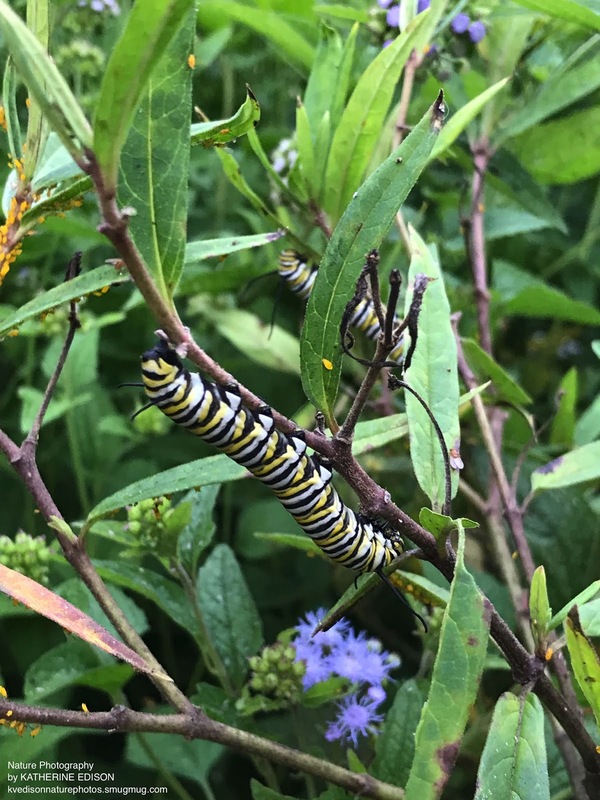 I mentioned this my previous blog, but I think it is important to see Monarchs as part of a bigger ecosystem and not protect them at the expense of their predators who depend on them for food. A few days later, the Lynx spider was missing. I thought she'd become food herself, caught by a bird or squirrel. But then I noticed her on top of a different bush where she could be even more stealthy. 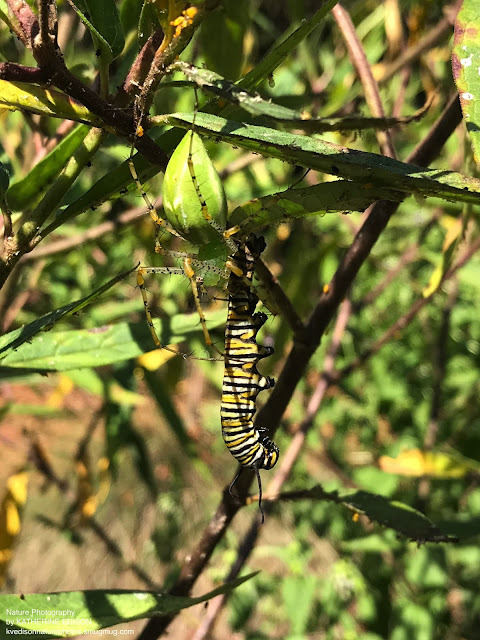 Truth is, the Monarch caterpillars were quickly defoliating the milkweed, so it was a smart move on her part. And just in time, too, because a few days after that I found her again, looking much thinner and clutching a huge egg sac. She tended the sac for several weeks. 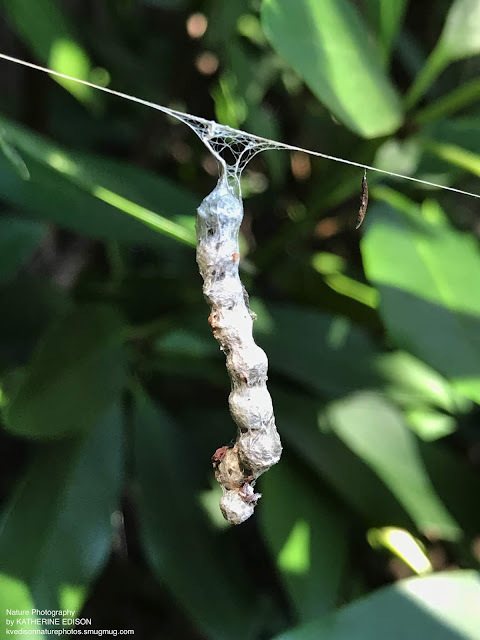 Then one day I checked on her and she was gone, but the eggs had hatched and dozens of tiny spiderlings clung to the remnants of the sac. 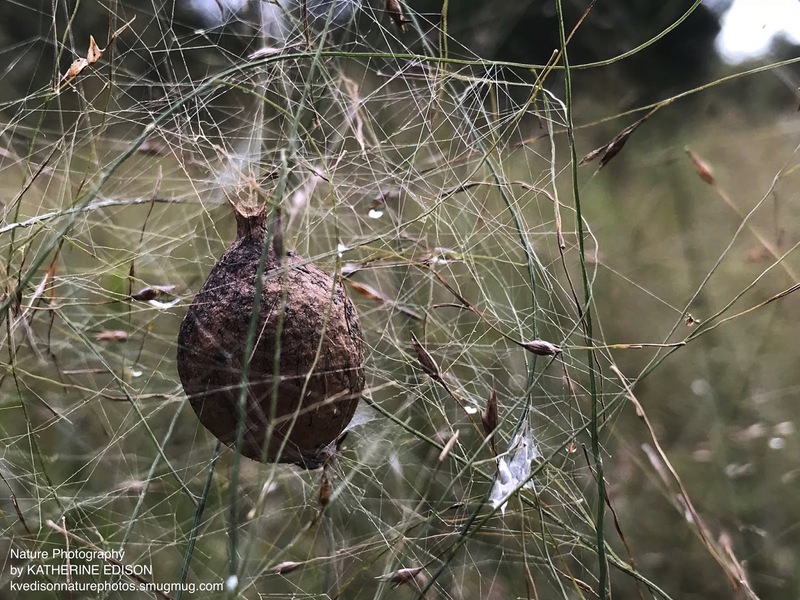 I read that after about 2 weeks, the spiderlings would shoot strings of web into the wind (this is called "ballooning") and would be carried off to new locations to begin their adult lives. The cycle of life. Holding her egg sac. Note small abdomen. 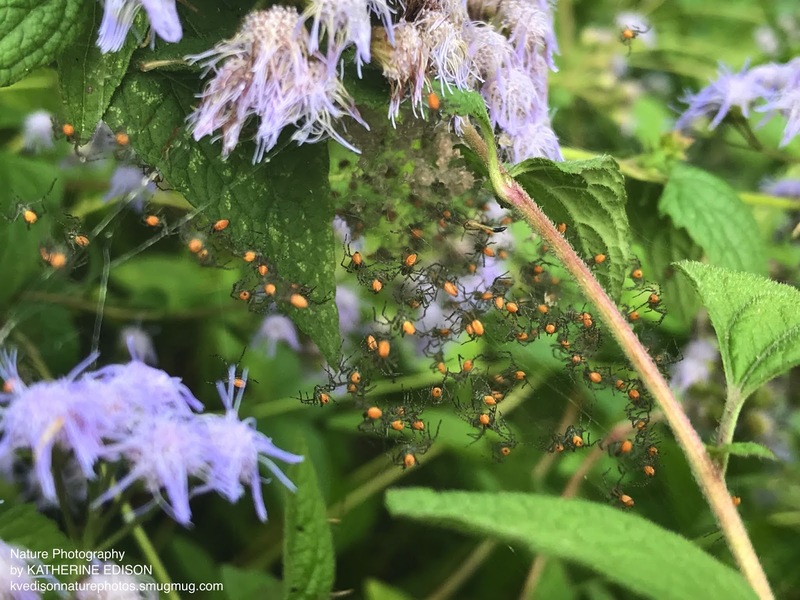 Spiderlings cluster around the egg sac. Click here for a video of the spiderlings wiggling. 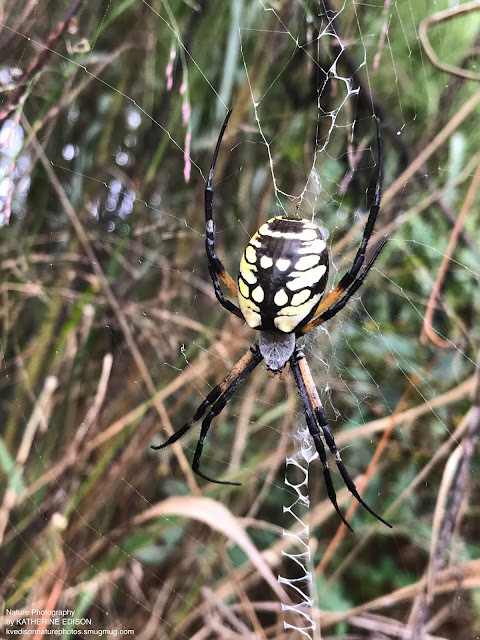 Also active this time of year are the Argiope or Garden Orbweaver spiders. We have a couple of varieties here in Georgia. 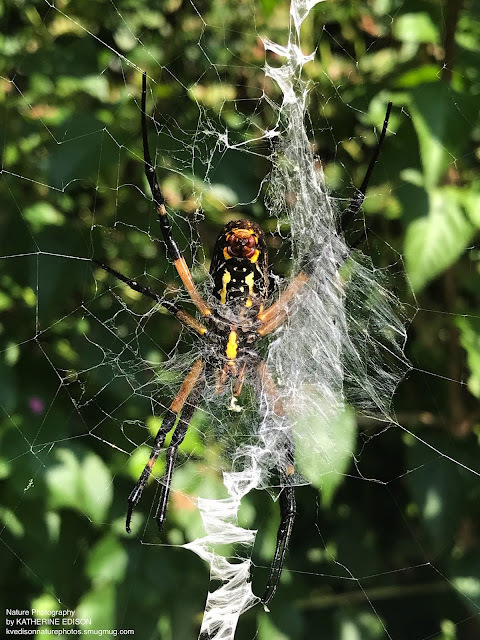 The Black and Yellow, or Zipper, or Writing spider and the Banded Garden Orbweaver. They make huge webs in perfect orbs and often decorate them with little lacy segments, call the "stablimentum". The purpose of the stablimentum is not exactly clear. 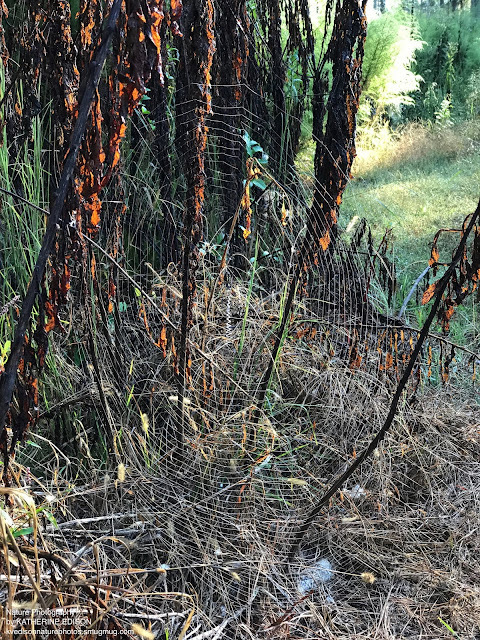 The spiders may hide behind the screen they create, or it may alert birds to the presence of the web so they don't fly through. These spiders often perch in the center of the web and jiggle it back and forth and the stablimentum may attract prey to the web. Whatever the purpose, the effect is very interesting. 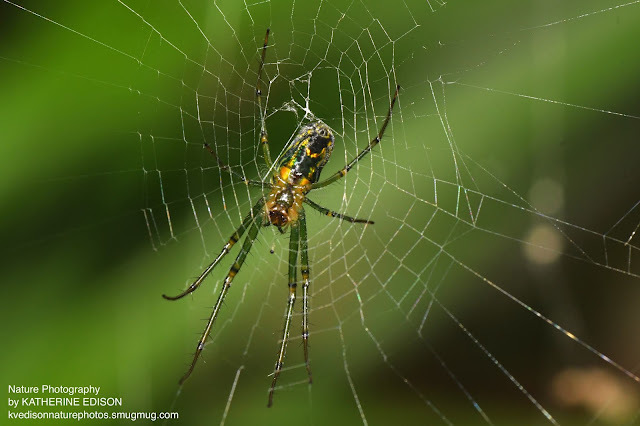 Some spiders make more of a zigzag in their web, thus the name "Zipper Spider". They are fierce predators and you will often find a large grasshopper or butterfly wrapped up in silk in the web. 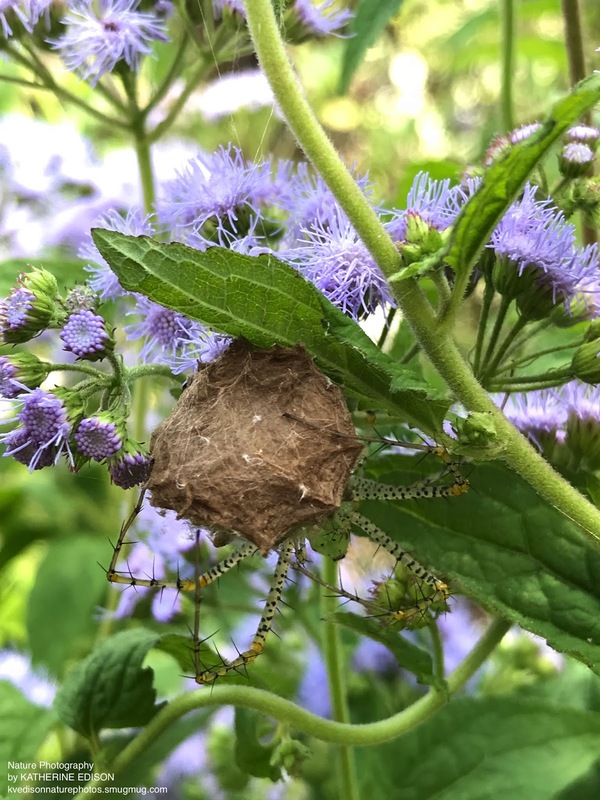 In September I found a bundle in a Garden Orbweaver web and was a little afraid that it was a hummingbird. After looking more closely, I think it was a large moth. But a spider's gotta eat, too, right? 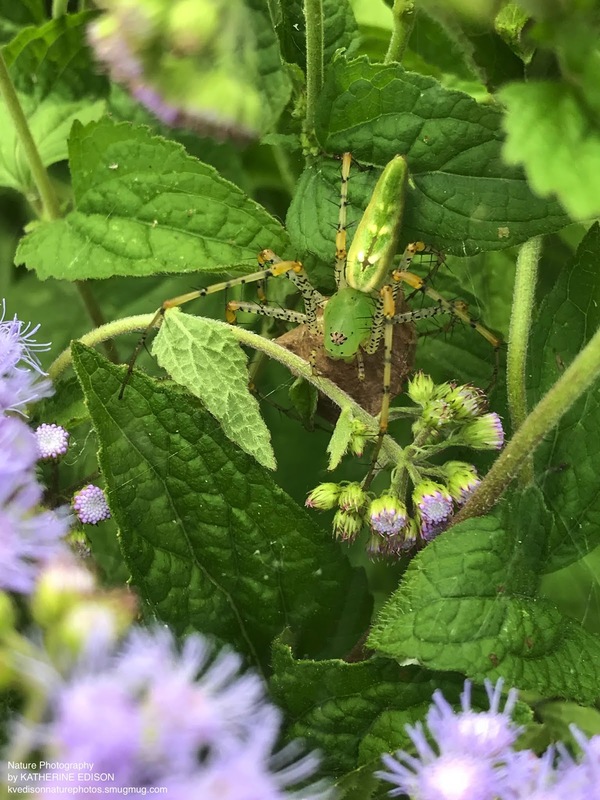 A few weeks later I was in the right place and time to see a Banded Garden Orbweaver nab a grasshopper. I never realized how quickly they can immobilize and wrap their prey. 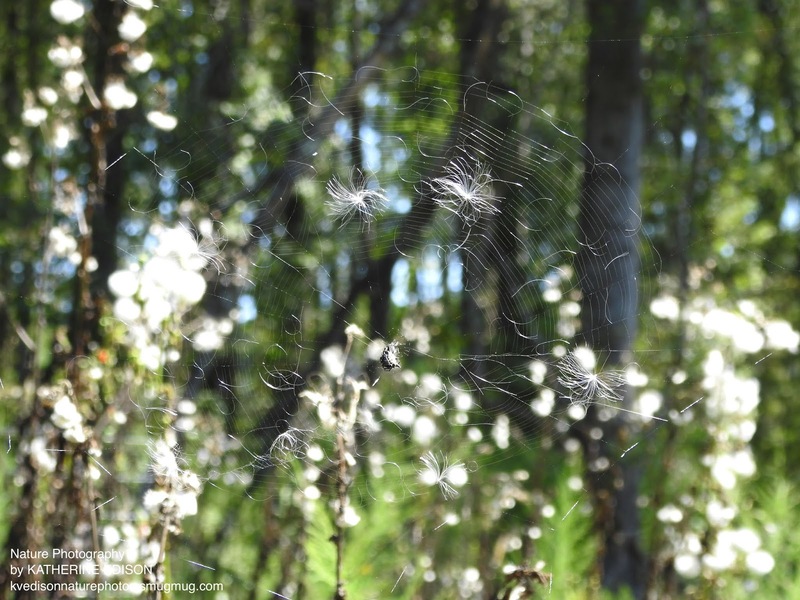 Their spinnerettes can produce sheets of silk when they need it, rather than just one strand. It was fascinating. 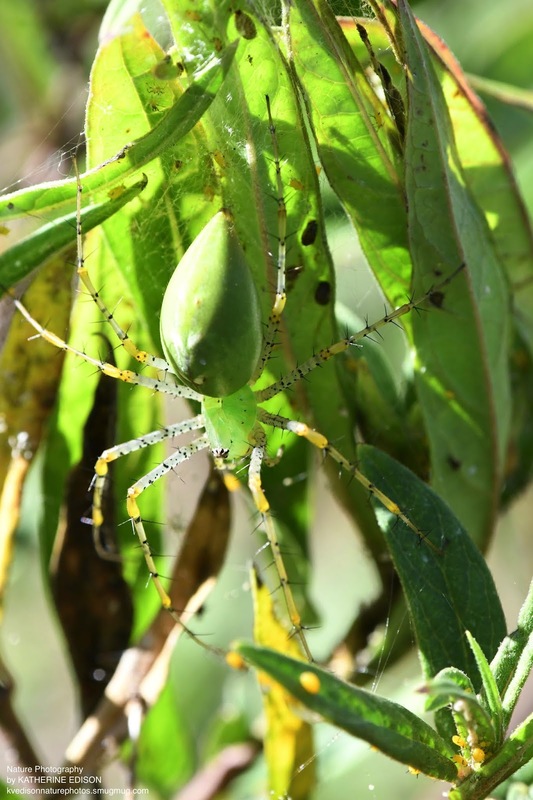 Many of the female spiders at this time of year are eating for more than one, with their huge, egg-filled abdomens. Argiope spiders make an egg sac that resembles a balloon. Black and Yellow Argiope behind stablimentum. Hiding from prey? 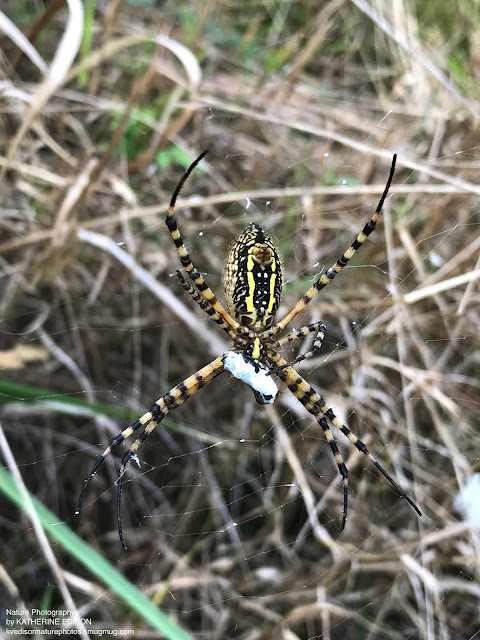 This Banded Argiope spider caught a grasshopper. Note the fancy striped legs. 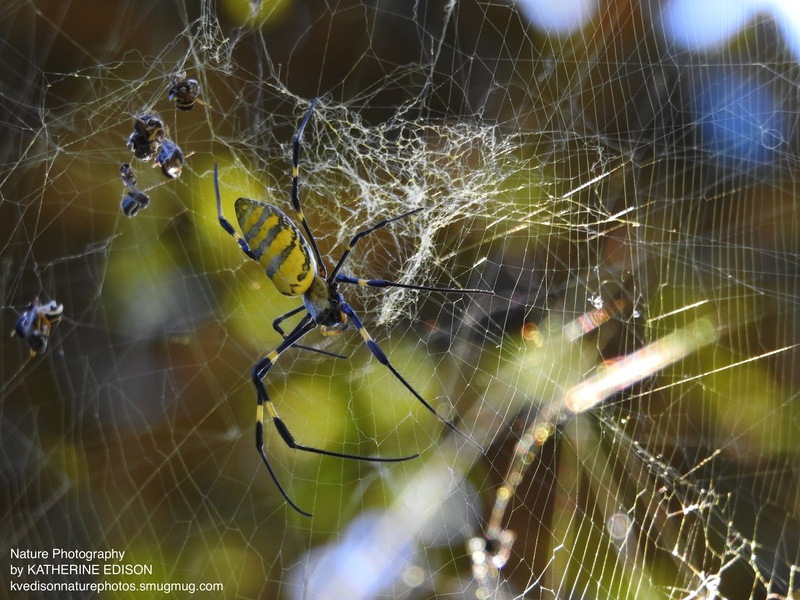 I mentioned the Golden Silk Orbeaver (Nephila clavipes) spiders found in Florida. I hadn't seen any up here in North Georgia yet. But recently I read reports from our natural history museum that some had been spotted up this way, along with a related spider from Asia, called the Jorō Spider (Nephila clavata). The first reports of this spider in North America have been here in Georgia. They're quite large and very pretty and I hoped to see one some day. Well, my wish came true this fall, and I found one, all right--in my own yard! As I have talked to people about this it has become clear that they are very widespread now and many of my friends have seen them, too. I have been watching this one grow from a smallish, skinny spider to a magnificent beast with an ever growing web. She seems to mostly catch bees, but one day I startled a Brown Headed Nuthatch and it flew into the web and became stuck. Here is a link to a video of the encounter on my photo website. I helped it out and have been checking the web for birds every day since then. So far there have been no other bird snags. I was tempted to remove the web and kill the spider because she is a potentially invasive exotic. But I really hate to do that. They're beautiful animals, just doing what they need to survive. I have not heard yet whether people consider them a problem, and I'm not sure how much good it would do to kill just one, anyway. Meanwhile, I'll keep watching the web and will hope for the best. And we'll see what spiders appear in the garden next spring. I've been away a lot this summer, but I am happy to report that our garden is doing just fine without me. Luckily, I put in a few days of weeding and thinning in June, or the whole place would be a mad jungle, overgrown and covered with towering goldenrod and swamp sunflowers. Instead, it is a lush and thriving riot of colors, but with some boundaries! And so when I returned this week from yet another trip out of town, I was tickled to discover about 20 monarch caterpillars happily munching on the big Swamp Milkweed (Asclepias incarnata) in the front yard. It is common to see Monarchs here all summer, but the population really picks up in September and October as the butterflies make their way, usually above the treetops, to Mexico for winter. I believe that the caterpillars I'm seeing were from eggs laid one or two weeks ago. 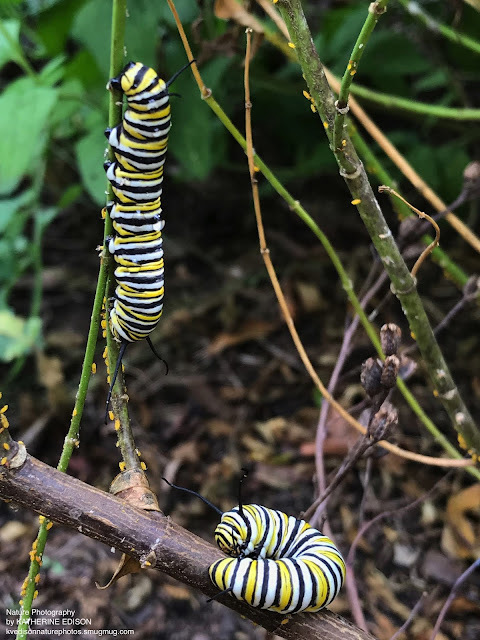 It appears that there are two batches on the bush--the big fat ones that are just about ready to pupate, and the ones about half their size that will be grown in about a week. I saw a female laying eggs yesterday and I hope that the ravenous hordes leave a few branches for the last generation. This is important to me because I love Monarchs. 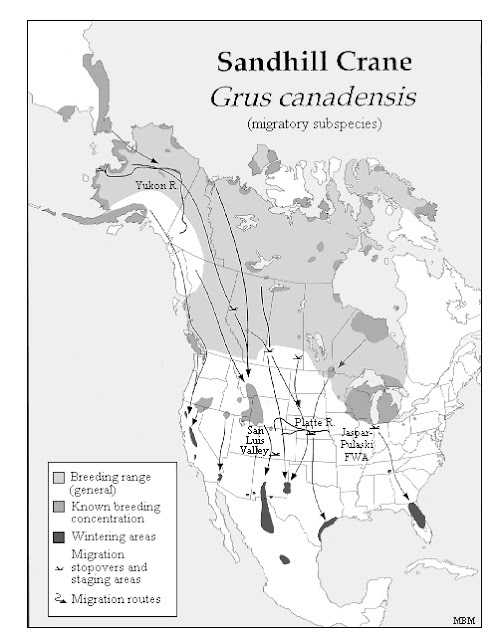 They're really pretty, and who doesn't admire their amazing migration story? And they're in danger. 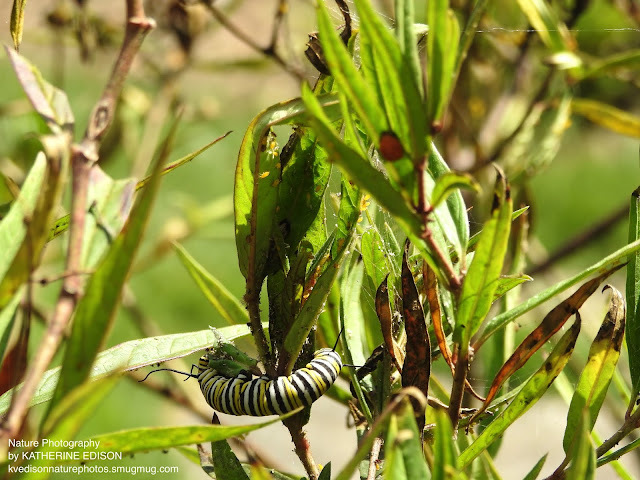 Monarch populations have decreased by about 90 percent from numbers recorded over 20 years ago. The causes are many--habitat destruction, pesticides, herbicides, and loss of their food source--milkweed, to name a few. It's exciting and uplifting to participate in the Monarch life cycle. Our yard is certified as a Butterfly Habitat and is a stop on the Rosalynn Carter Butterfly Trail. Monarchs will only lay their eggs on plants in the Milkweed family. There are many varieties specific to regions of the country. We plant native nectar and host plants for many kinds of butterflies and refrain from using herbicides or pesticides in the garden. The result is a healthy habitat for all sorts of creatures--butterflies, bees, wasps, birds, moths, spiders, etc. Aphids infest the milkweed every year. They drink the sap. I don't mind them, but if they bother you, you can squirt them off with a hose or just brush off with a paint brush. Pesticides will harm other insects, such as butterflies. But the garden is not without its perils for the butterflies. Last night I walked past the milkweed bush again and flushed a bird that was probably hunting for caterpillars and bugs on the stems. A moment later I spotted the female Monarch that earlier I had watched lay eggs. 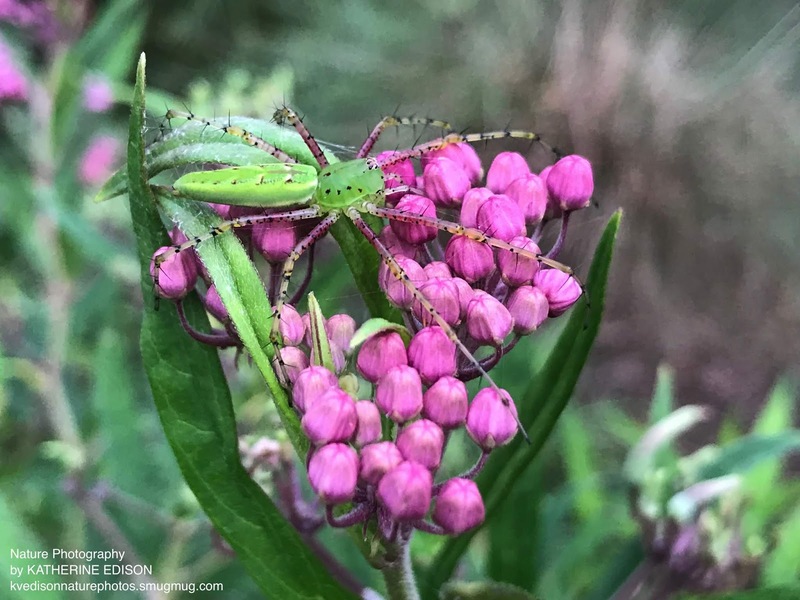 She was caught in the jaws of an enormous Green Lynx spider perched on top of the milkweed bush. The spider had caught the butterfly and was eating it. I felt a temporary twinge of sadness for the butterfly, but then cheered for the spider who needed food for herself. Her huge abdomen was swollen, probably with eggs, and she needed nourishment, too. The butterfly had passed on her genes through her eggs, so she had fulfilled her biological destiny and was now part of the food chain. Whether those eggs will grow to adults and also pass on genes is a crap shoot. 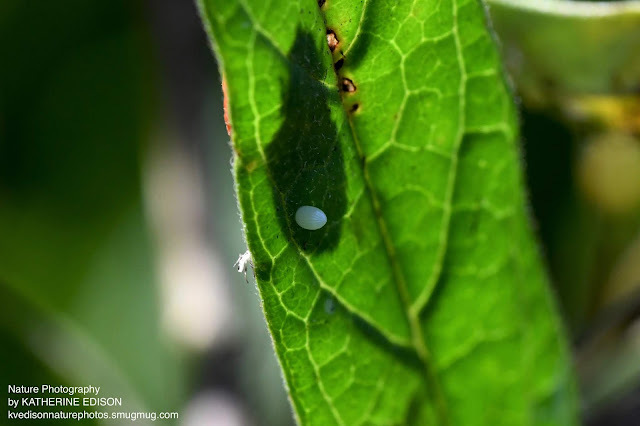 But this is why butterflies lay so many eggs, and why it is important for there to be milkweed patches all over for them to lay their eggs on. 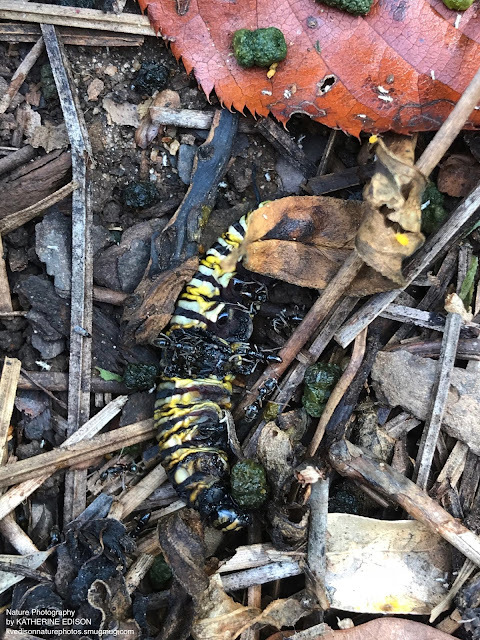 This morning I found that the spider had caught one of the caterpillars and was busily sucking it dry. Birds and wasps catch and eat them, too. Aphids are very attracted to milkweed. 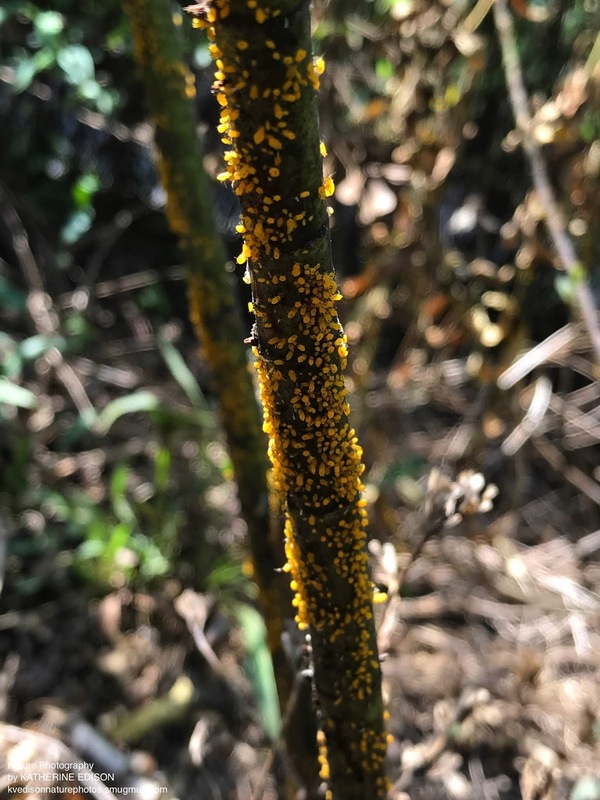 They are sap suckers, and sometimes they will harm or kill the plants. 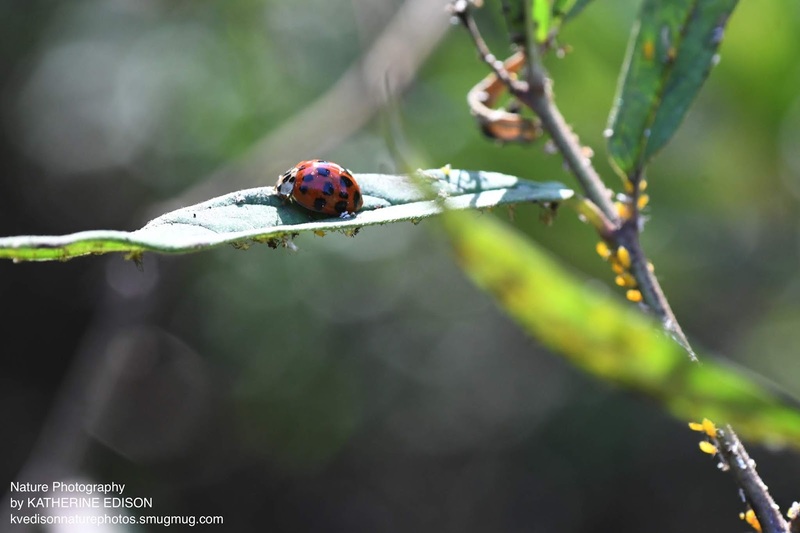 But the aphids attract ladybugs and their larvae that snack on aphids like popcorn. 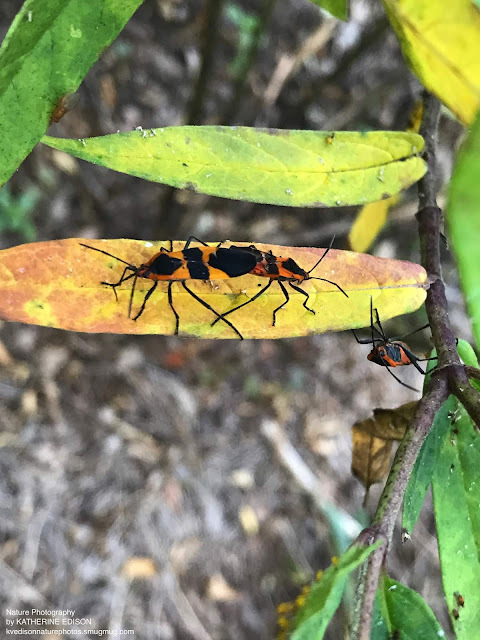 Milkweed Bugs make their home in the plants and eat the seeds, and Milkweed Beetles eat leaves. 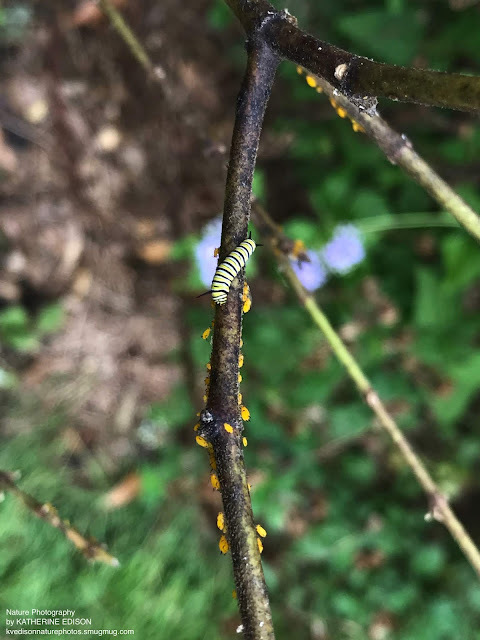 The 20 hungry Monarch caterpillars will strip the leaves off the bush within another week or so and may eat themselves out of house and home. All these beings are competing for the resources on these plants. Something killed this caterpillar, and now it is food for the ants. 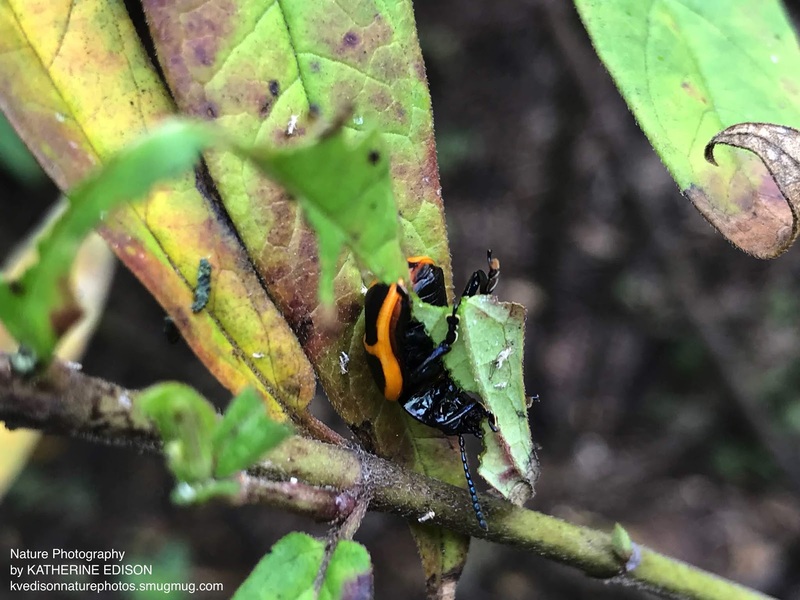 The green blobs are caterpillar poop, also called "frass"
Some people who grow butterfly gardens will collect the eggs and grow the caterpillars to adults inside protective enclosures to keep them safe. I totally understand their care and concern, but as I told someone yesterday, I am more of a "free range" butterfly gardener. It makes me uncomfortable to make these creatures my captives. I feel much better about providing an opportunity for them to grow and thrive out in the world, but as part of a greater ecosystem. That's another aspect of the tragic loss of the massive Monarch population. 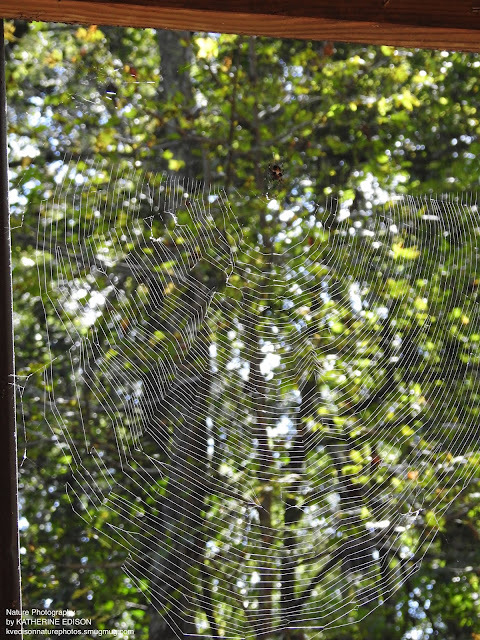 They are part of an interdependent web of life. We all feel their loss. 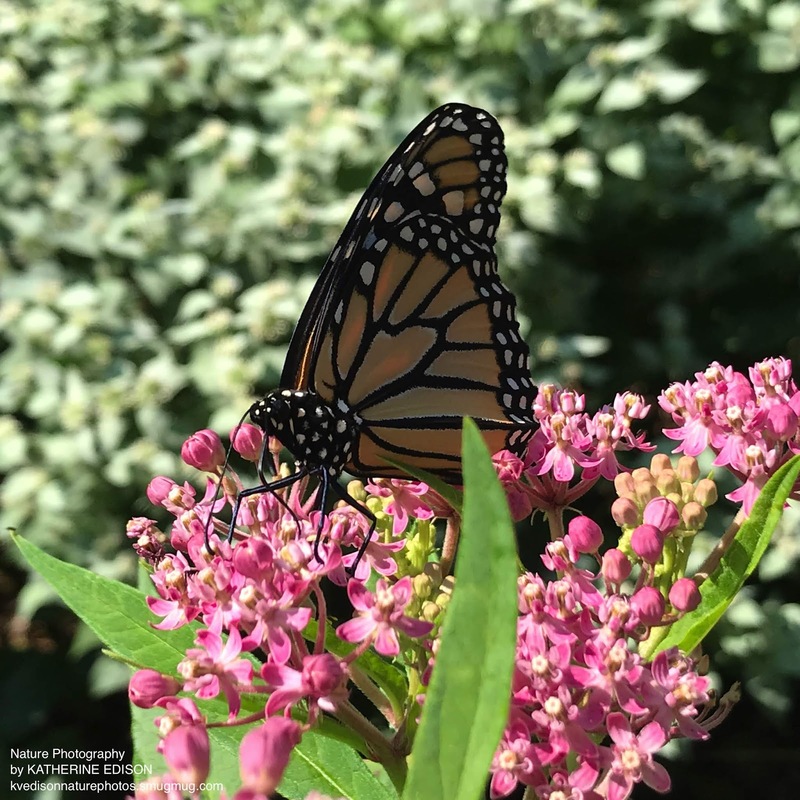 I encourage everyone who has an interest in helping the Monarch to try to plant native milkweed in their garden or even in a container garden on a deck. 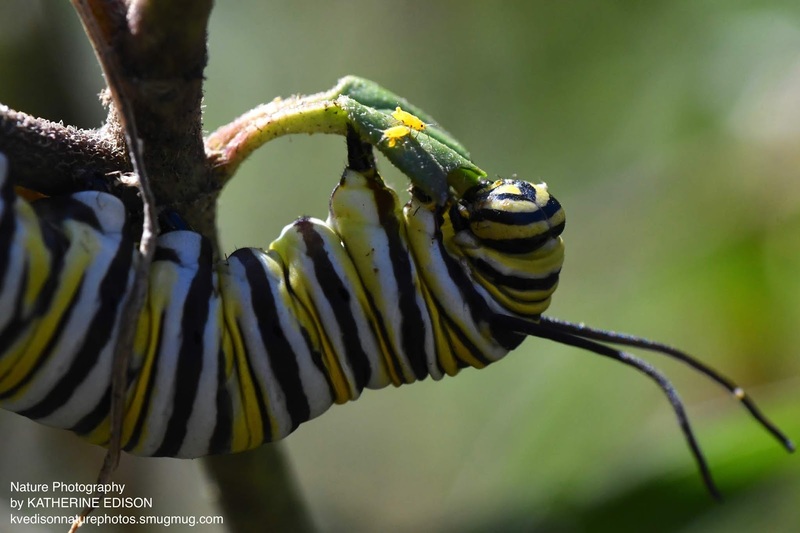 Do your part to help keep this iconic insect from disappearing. Go out and garden on! Earth teach me caring as parents who secure their young. Earth teach me limitations as the ant which crawls on the ground. Earth teach me to remember kindness as dry fields weep with the rain. I'm a photographer and nature lover in Georgia, via Florida, and originally from Utah. I want to share my love of the natural world with others, and in doing so, I hope to spark an interest and love for the earth and its beauty. "Every Color in the Rainbow", my Colorful Wildflowers Photo Book on Blurb. Available as an ebook, too! All photos copyrighted by Katherine Edison. Picture Window theme. Powered by Blogger.